Ancient Africa or Libya Part II. This is a fine example of the 1840 Society for the Diffusion of Useful Knowledge or S.D.U.K. map of northern Africa in ancient times. It depicts the various ancient kingdoms and offers a good detail in the deserts - some of which is entirely speculative. 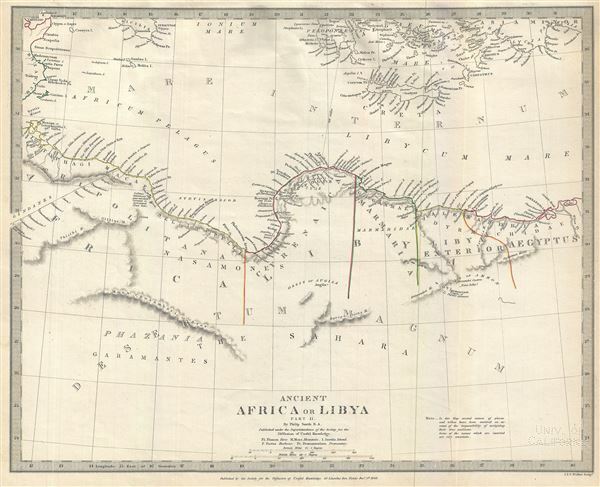 Depicts the ancient regions of Tripolitania, Cyrenaica, Marmarica, Phazania and Aegyptus. Various ancient cities along the coast, rivers, mountains and other topographical details are noted, with relief shown by hachure. A note in the bottom right quadrant remarks, 'In this map several names of places and tribes have been omitted on the count of the impossibility of assigning their true positions. Some of the names which are inserted are very uncertain.' The Garamantes, the earliest known name of a tribe that was the ancestor of the Berber people, is noted. The Carthaginian Empire was formed after Carthage gained independence from the Phoenician colonies in 650 BC. Carthage became the center for trade and the Carthaginian Empire dominated much of the region, until Numidia, the Kingdom to the west of Carthage, allied itself with Rome in 206 BC leading the Roman conquest of the region in 201 BC. By the end of the third Punic war, the city of Carthage was leveled by Rome, thus ending its independent existence. Carthage's great general Hannibal, nearly conquered Rome with his highly trained war elephants, before being turned back at the very brink of victory. Rumsey 0890.118. Phillips (Atlases) 794.